Berthoud is nestled between Loveland and Longmont, featuring a small-town feel with big-city ambitions. This town straddles Weld and Larimer Counties, making it the ideal location for those hoping to take advantage of everything Colorado’s outdoors have to offer. Berthoud’s small size is compensated by its wide range of local parks and fun events, from Sunfest in June to Snowfest in December. This small mining town plays host to Coloradans that have an affinity for the beautiful weather. Many of us along the Front Range aim to soak up the sunshine and fresh air as much as possible, yet some homeowners are limited by the amenities that their homes offer. One way to improve the enjoyability of your home while allowing for more fun outdoors is by installing a new deck for your Windsor abode. Our Decking Company Can Help! Tools. 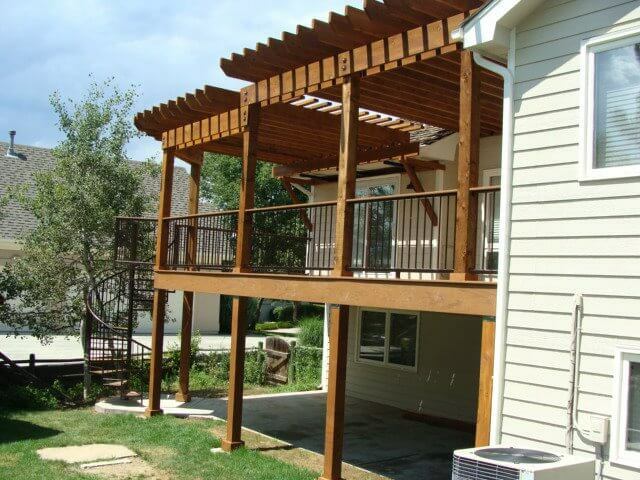 Our deck contractors also provide fence installations, pergola builds, and more. This equates to better tools and equipment, ensuring that your project is done on time and on budget. Training. Providing the best requires us to train like the best. Our deck builders go through rigid training to ensure that our customers receive the best product possible. The Rocky Mountain team aims to set the standard for high-quality deck and fence services, and our commitment to thorough training helps to make us your Top Rated Local® fence company. Experience. Every home is different, and each project will inherently involve its own unique set of challenges and setbacks. Our deck contractors have been in this industry since 1992, and we’ve worked on hundreds of projects over the years. When you place a call to our decking company, you’ll notice right away how knowledgeable and helpful each member of our staff can be. From new gates and fences along the perimeter to dynamic outdoor living spaces, our experts are here and ready to offer the best solutions to upgrade the value and livability of your Windsor home. Contact us today to learn more or to receive a free quote on your project!